Russia-based WarmKnives on Etsy has these grenade capsules available for sale on their shop. 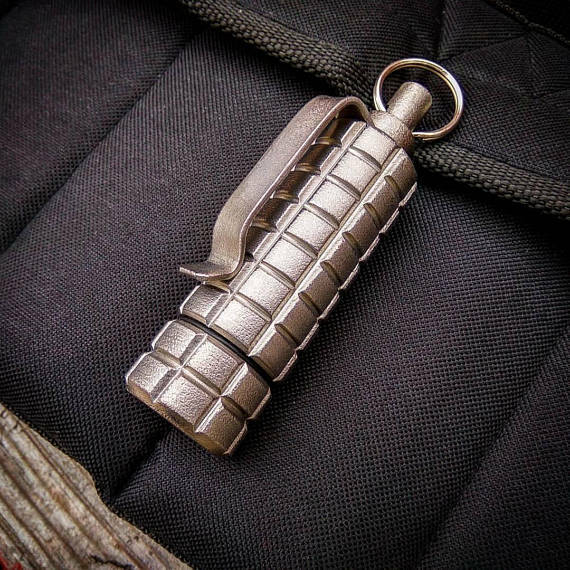 Made of titanium, the capsules feature a screw opening, along with a keyring and side clip. 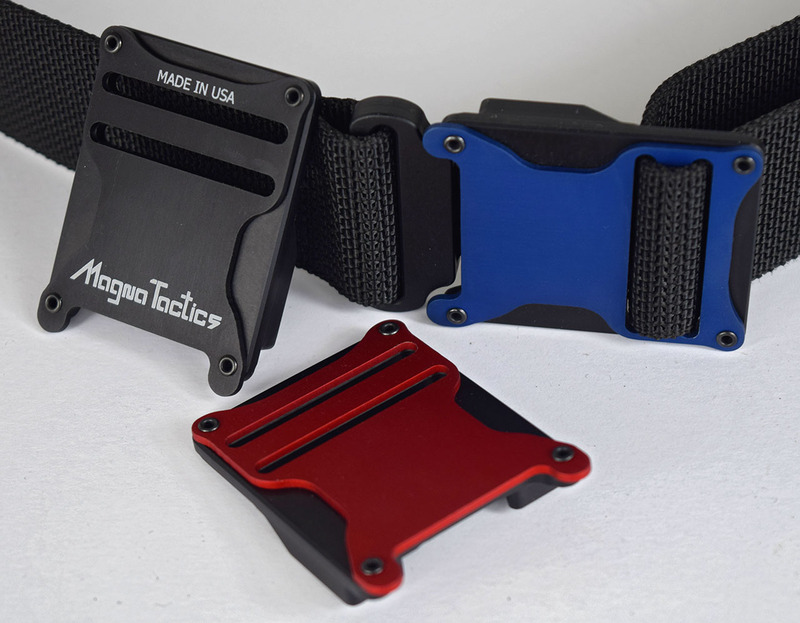 Magna Tactics, a US-based start-up company operating out of the Pacific Northwest, is setting a new standard of tactical gun belts using a unique buckle design that is focused around a proprietary magnetic latch. Dissatisfied with the comfort vs. performance compromises associated with typical gun belts, owner and founder Mike Howe set out on a quest to develop a better gun belt, one that satisfies the needs of CCW users, yet doesn’t sacrifice the comfort of a standard belt. 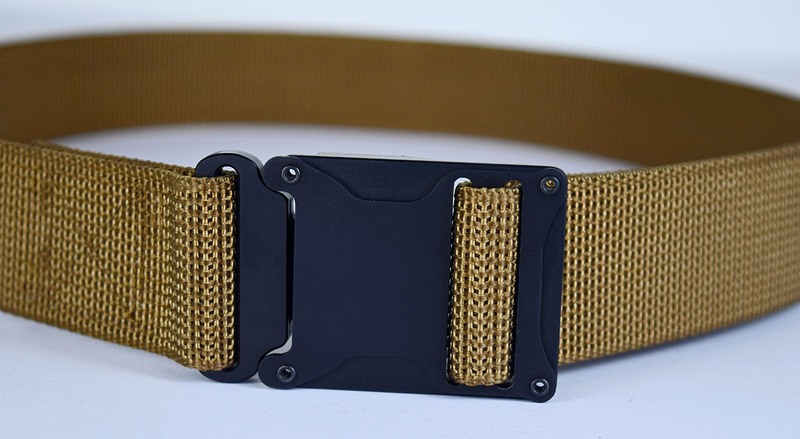 With the carefully procured high quality webbing used in this belt, the single layer belt is more than sufficient for a vast majority of peoples EDC needs. 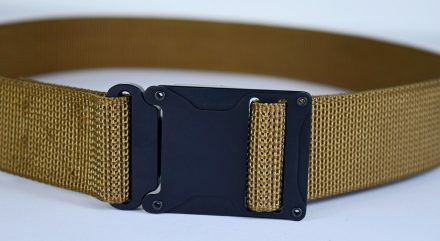 While they are currently prototyping a double thick belt, the double thick would only be necessary for those who do competition shooting and carry more gear than you typically would in most scenarios. Fast magnetic latch – Housed in durable anodized, hard coated 6061 aluminum, the high tech Polymagnets used in this belt have a stronger, faster, and more accurate alignment than any other magnets available. 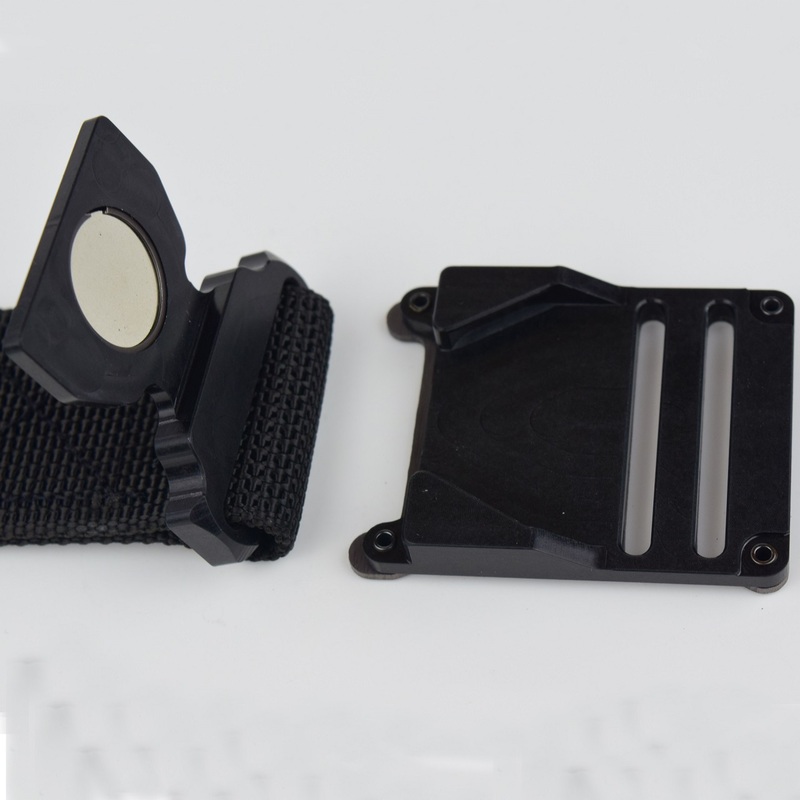 Slim buckle design – Unlike most tactical belts, this buckle fits through standard belt loops, slide the belt in and out of any pants without ever changing the adjustment size. Pivoting latch – A small range of motion has been designed in to help the belt move with you for comfort. Single size – No need to worry about picking the wrong size, simply cut to length, and adjust to size. One-time adjustment – Stays adjusted to the size you pick until you want to change it. Tail tucked, or tail out – The Magna Belt offers the option of tucking the belt tail inside, or outside, without sacrificing any strength of the belt in either configuration. Berry Amendment Compliant – Using USA made MIL-SPEC webbing (1.5”) and thread. Lifetime Warranty – Because it’s built to last, we offer a lifetime warranty against any manufacturing defects that affect your belts function or quality. The belt is also offered in a variety of color options for when you want to keep it sleek, or get flashy. The colored buckle plates are interchangeable, allowing you to purchase additional plates and swap them to suit any mood or occasion. Blue Force Gear made 25 of these custom pouches for “Star Trek Beyond”. This post was originally featured on SSD. 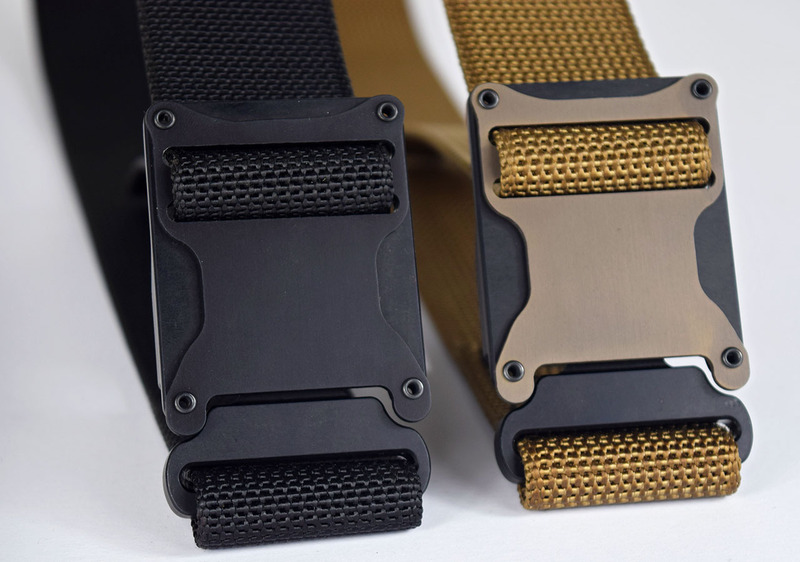 Starting at $65 for an early bird special, the Magna Belt is a sturdy and rugged belt made to revolutionize the belt market. It boasts many features unique to an EDC belt making it stand out from the crowd. Single size – No need to worry about picking the wrong size. 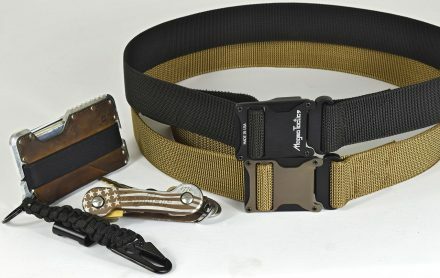 Fits through standard belt loops – Most tactical belts require large loops to fit through, but not the Magna Belt, slide the belt in and out of pants without ever changing the adjustment size. Patent pending design – You won’t find this belt anywhere else. The belt will be offered in a variety of seven plate colors to start with, along with potential for more colors depending on demand. They also will releasing a fully stitched double thick belt for extra support, if the campaign funding reaches the stretch goal before it ends on July 6th. Magna Tactics founder Mike Howe has years of experience in both the product design, engineering, and manufacturing sectors, in everything from high end automotive parts, to tactical EDC gear. Branching out now to start his own business, he hopes to bring high quality American made products to the market, and help bring manufacturing and jobs back to the USA. Mission Critical’s Baby Carrier is a great option for tacticool dads everywhere. Made of 1000D nylon, the carrier features PALS webbing on the front and rear, along with YYK zippers, and a sun shield for the little one. 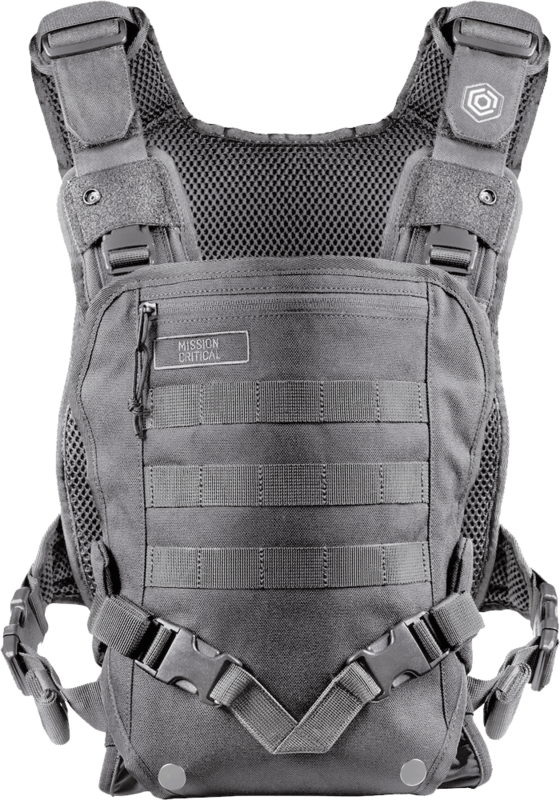 This Baby Carrier also meets all applicable ASTM regs for baby carriers, and is designed to hold children up to 35 lbs. Available in Black, Coyote, and Gray.